I have recently finished writing this e-book. I am selling on SEOclerks for the last 3 years and it has been an wonderful experience. I have totally written this ebook based on my personal experiences on SEOclerks. Hence it is a great starter pack for the newbies and also a great asset for old sellers who are struggling to make an impact on SEOclerlks. The secrets reveals the easiest and the most convenient ways to gather and collect positive reviews on your SEOclerks profile. You will find these secrets really amazing and unique and you will be toally blown away by the results! GRAB IT NOW!!!!!!! The things you are about to read can be applied to any online business you have. The only thing I am going to discuss here is how you can boost or get more positive reviews on your profiles. Of course the number of positive reviews on your profile is really important and it makes your profile strong and the buyers/clients feel more affirmative, confident to buy services from you. 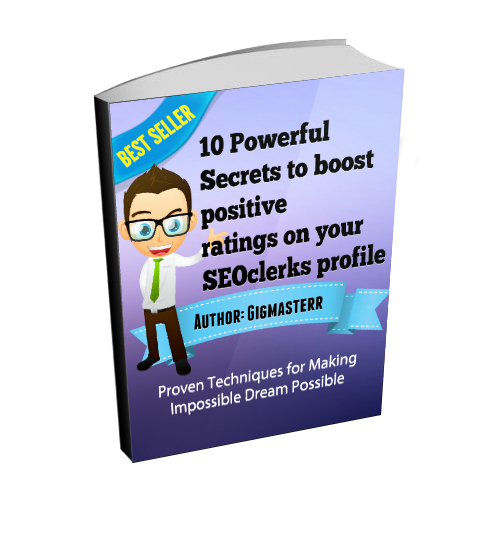 10 Secrets to boost positive ratings on your SEOclerks profile is ranked 5 out of 5. Based on 3 user reviews.